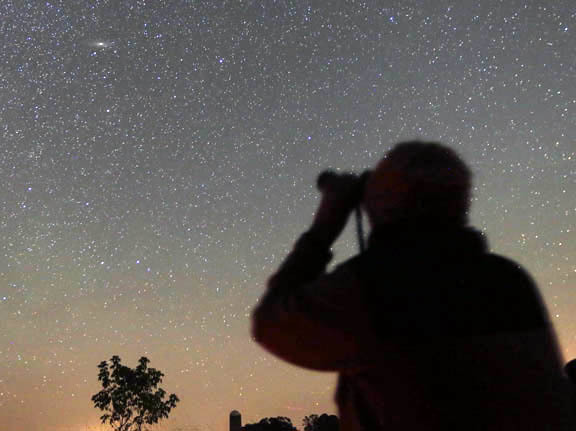 If you are looking to get started with amateur astronomy, binoculars are the ideal instruments for the beginner. Their low cost makes them affordable to almost anyone. Binoculars are available in a variety of sizes and magnifications. Because of their wide field of view, they are also a necessary and popular tool for the experienced astronomer as well. Make sure you get a pair with a tripod mount. As far as magnification goes, smaller is usually better, believe it or not. Binoculars with high magnifications will be shakier when held in the hands. This can become annoying during an evening of observing. Some astronomy suppliers carry devices that can help stabilize the binoculars by propping them up against your body. Lower magnification will also provide a wider field of view. The best advice for choosing a pair of binoculars is to get what you feel comfortable with. Remember you may want to use them for bird watching or camping as well. If you're going with binoculars, bring a lightweight reclining lawn chair —a "lounger. "Your arms will thank you. Your back will thank you. Many a meteor shower has been won or lost based upon chair comfort!Telescope-jockeying skywatchers should seriously consider a purpose-built astronomy chair, especially if you own a refractor (because the eyepiece is "down" and the tube is long). The sliding seat can get low to the ground, or as high as your eye would be when standing. The best ones have a padded backrest. When you're observing at night, you're going to need to read a star chart or a planet finder or your telescope markings. You will need to find items like eyepieces or your coffee mug. An astronomy tool like this Celestron Astro Night Vision Flashlight goes for around $10, but there are many models to choose from and some are less expensive. It takes at least 20 minutes to become dark-adapted. Some experienced observers say their eyesight doesn't peak until after more than an hour of complete darkness. A 10-millisecond flash of white light from a cellphone or car headlight can reset your eyes back to "do over." If you are interested in starting your journey with astronomy then go ahead and just do it, it relaxes the body and the mind. Don't forget to name a star for yourself or others so you can take those new binoculars and see your star.